Nation Turns Blue As Temperatures Continue To Plunge : The Two-Way You need to look at only one map to see how cold it's going to be across nearly the entire nation. In the upper Midwest, wind chills will once again be down around 40 degrees below zero. Freezing temperatures are expected as far south as Texas and Florida. 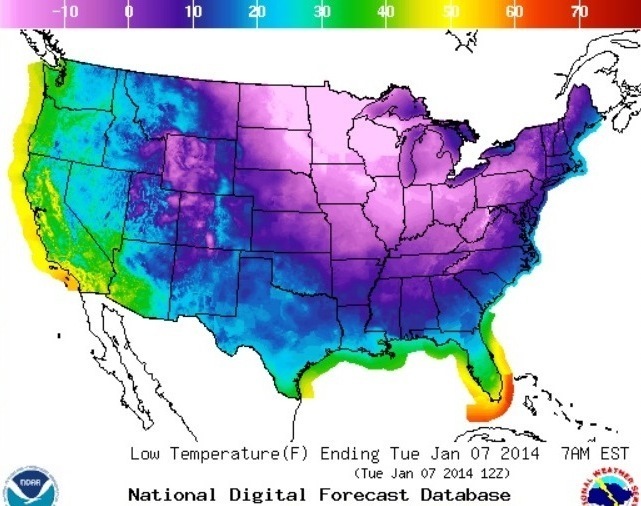 If you're in a blue or purple zone, you're going to be cold tonight. One weather map tells the story. Check out the National Weather Service's map of the Lower 48 for Monday night. If you need to know just how much of the nation's going to be freezing (or well below! ), it offers a bone-chilling picture. Anywhere in the blue-to-purple shades is going to be cold — and that's before accounting for wind chills. What is the Weather Service forecasting? "Cold temperatures and gusty winds associated with an arctic airmass will continue dangerously cold wind chills as far south as Brownsville, Texas and central Florida. This arctic airmass will affect the eastern two-thirds of the country on Monday as a sharp cold front moves towards the East Coast. The cold temperatures will remain in place through mid-week before a warming trend begins." The Weather Channel says this is the "coldest Arctic outbreak ... since the 1990s." Alison Mueller skies to work through several inches of snow in Detroit as the area deals Monday with record-breaking freezing weather. Wind chill has driven temperatures in Michigan and much of the Midwest down to 50-70 degrees below zero. John Douglas shovels snow off his car in Indianapolis, as temperatures hovered around 10 below zero. 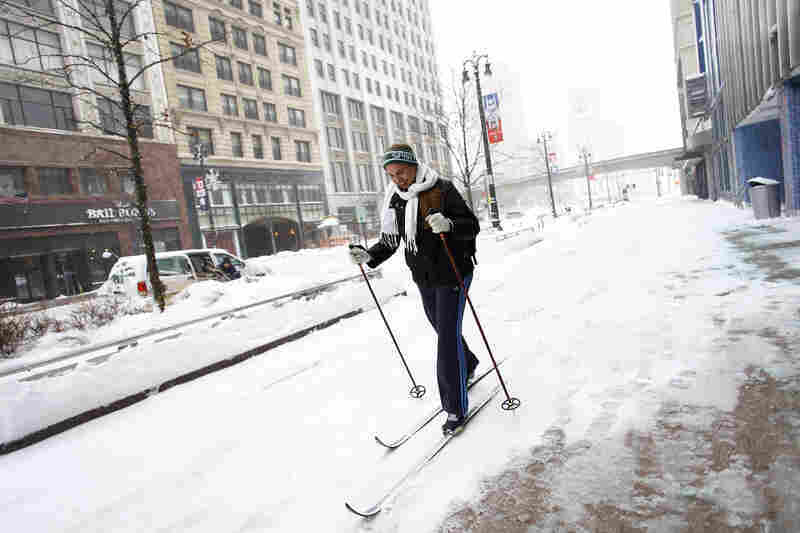 More than 12 inches of snow fell on Sunday. 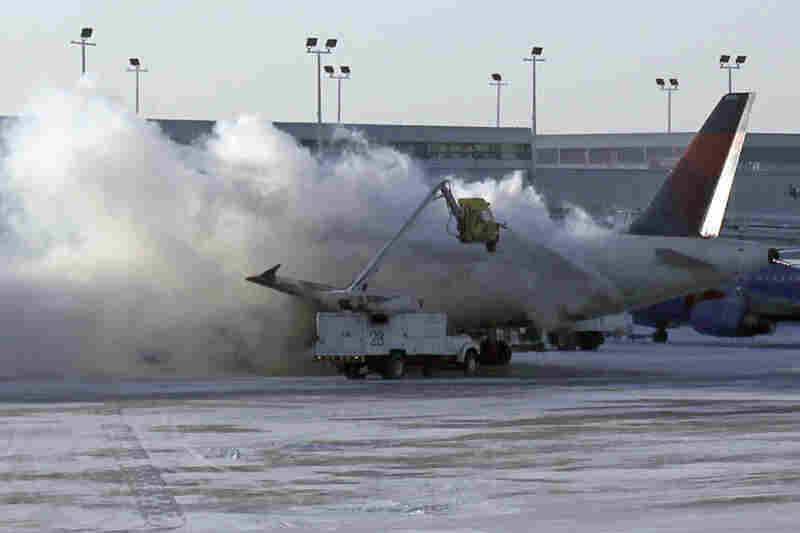 A Delta plane is deiced at Chicago Midway International Airport. More than 1,000 flights were canceled Sunday at airports throughout the Midwest; more than 400 flights were cancelled Monday. 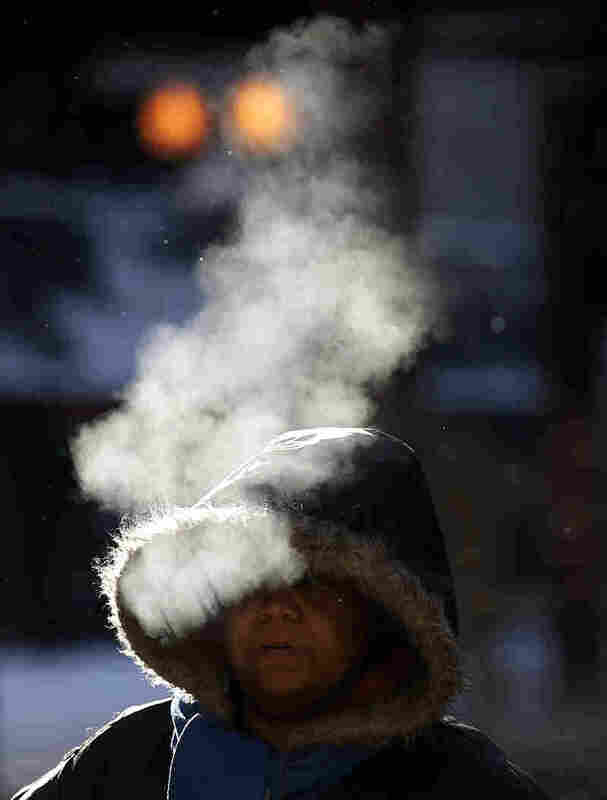 A woman walks in frigid temperatures though downtown Chicago. A blast of Arctic air gripped the midsection of the U.S. on Monday, bringing the coldest temperatures in two decades. 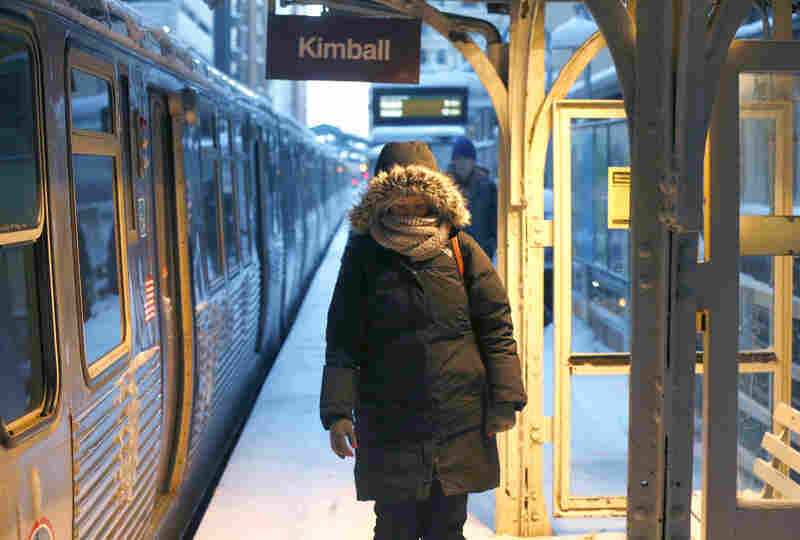 A commuter walks past warming lamps to an exit on Chicago's El tracks. 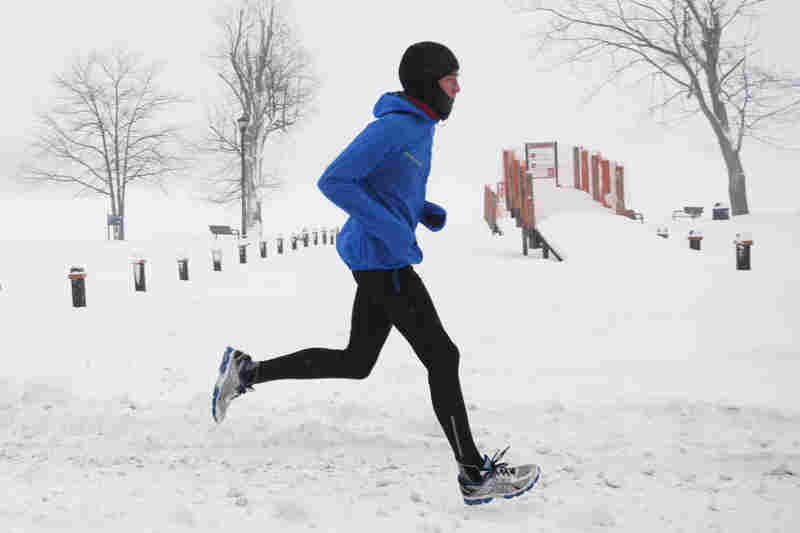 A man runs near Reeds Lake in East Grand Rapids, Mich.
With wind chills factored in, the network adds, parts of Minnesota, the Dakotas and adjacent states are going to feel like its minus-40 degrees (or even less) in the next day or so. The culprit behind this frigid blast is the "polar vortex," a low pressure system that's usually whirling around the North Pole but has weakened and come south. As The Washington Post's Capital Weather Gang says, the polar vortex is "diving into the Lower 48." The BBC adds that "the vortex has been very strong, with the cold air locked in to Arctic Canada for a long time. Stuck in one place, the air has got colder and colder. Cold air is dense so once it is released it travels a long way and that is why it is penetrating so far southwards, John Hammond from the BBC Weather Centre says." "By Wednesday, subzero high temperatures will be virtually gone from the Lower 48 States. Thursday, highs in the 20s or 30s in much of the Great Lakes and Northeast will seem downright balmy compared to earlier in the week."